I don’t know if I’ll ever get to play at all, but I recently picked up a Saga warband from Gripping Beast. I opted for the metal Vikings, which means I got four berserkers among my miniatures. 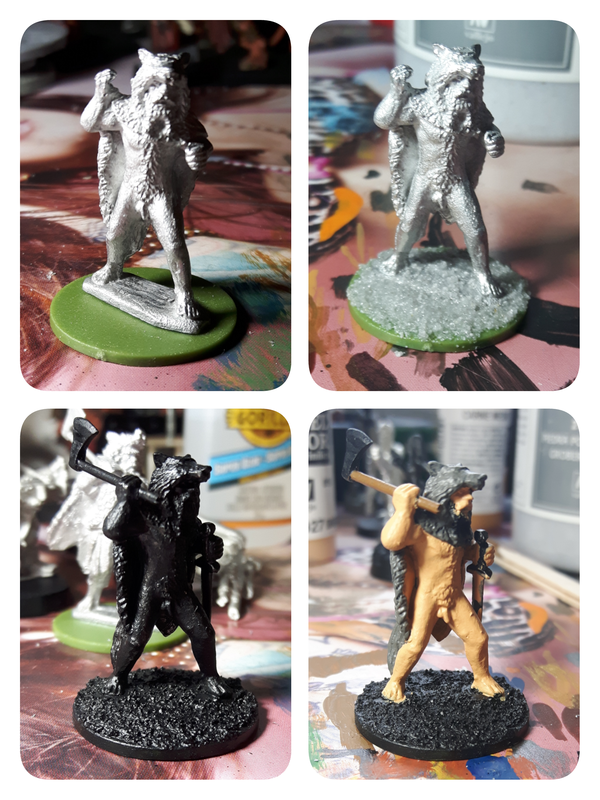 Being historical miniatures, there is of course some variance expected from what’s shown on the packaging… the packaging let me know I might get a berserker in a loincloth, I got one in the buff. Obviously he’s not done yet, but I thought I’d share the progress I’ve made so far. First step was to clean up the miniature a bit. It’s not the cleanest sculpt I’ve ever seen, but based on the reading I’ve done online I get the impression the bar for historical miniatures is a little lower than for some other genres. Given that these guys worked out to around $2 each, I think they look pretty decent. Next on my agenda was doing something about the base. As it’s a historical miniature, it has the traditional small flattish bar attached directly to the model’s lowest point. Yuck. 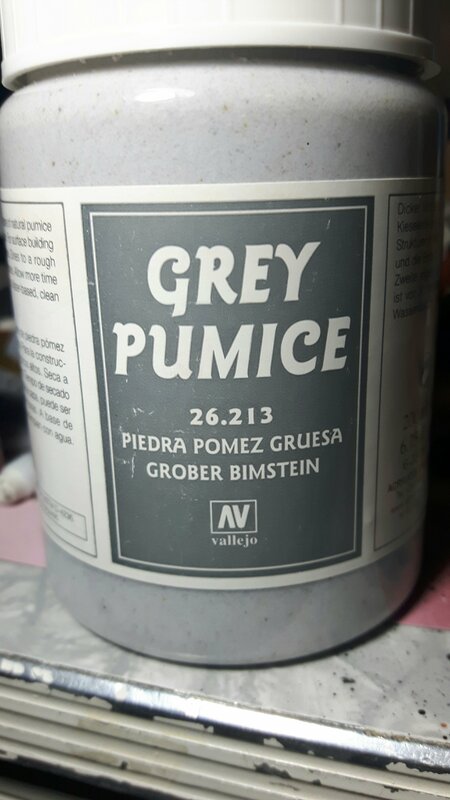 To deal with that I broke out my jar of Vallejo ‘Grey Pumice’. I believe they’ve changed the packaging since I got mine, but here it is! It’s basically a gritty acrylic medium that can be used instead of the traditional sand-and-glue method when basing models. I used it to build up the flat Renedra base until it appeared level with the top of the miniature base. Now it bevels at the edges and should dry brush nicely later. Another cool aspect of these miniatures that surprised me (again, probably nothing new to historical fans) is that almost none of these miniatures came armed. A couple were sculpted with weapons, but most had cupped hands awaiting a weapon selection, and the warband came with a bag full of swords, axes, shields, and spears. This fellow came with one cupped ‘weilding’ hand and an arm braced for a potential shield, but I felt like any Berserker *so* berserk that he charges into battle naked was probably not going to hang onto a shield (or any particular equipment) mid-battle, and therefore worthy of a random assortment of weaponry. With that in mind I did some modification to the shield arm so I could put a sword in his off hand. At this point I broke my only appropriate micro bit, and the new ones I ordered online have still not arrived even now. Last weekend I got tired of waiting and carved the hand out using the broken remains of that last bit. It was messy, but it worked. A coat of brush-on primer went on after that, and this weekend I started painting him. I feel like the paint is really bringing out the imperfections in the miniature, but hopefully they won’t be too obvious when all is said and done.